By Cristy Lytal, Public Communications Manager, USC Stem Cell. Twenty-three local high school students spent their summer vacations in a very unusual place: the Eli and Edythe Broad CIRM Center for Regenerative Medicine and Stem Cell Research at USC. The students celebrated their graduations this month from the USC Early Investigator High School (EiHS) and the USC CIRM Science, Technology and Research (STAR) programs. These are the only programs that offer comprehensive training in stem cell research to high school students. The goal of these unique programs is to educate bright young minds at the stage where they’re still formulating ideas and still open and receptive to new discoveries. “The goal of these unique programs is to educate bright young minds at the stage where they’re still formulating ideas and still open and receptive to new discoveries, and introduce them to the wonder and inspirational power of stem cell biology,” said Andrew McMahon, director of USC’s stem cell research center and the Department of Stem Cell Biology and Regenerative Medicine, and head of the university-wide USC Stem Cell initiative uniting more than 100 researchers from all disciplines. 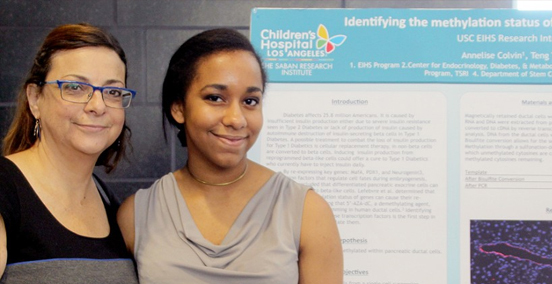 Over the course of the summer, the high school students participated in either a 10-day training course or eight-week research internship, working with human stem cells in USC’s world-class laboratories. Under the mentorship of USC faculty and graduate students, the students learned about the latest advances in regenerative medicine and explored stem cells, ethics and public policy. Roberta Diaz Brinton, director of the CIRM STAR program, paid tribute to the accomplishments of the students. “We’re very impressed by the caliber of science and more impressed by the caliber of young minds. These young scientists are generating the new knowledge from which stem cell biology and stem cell therapies will progress in the future,” said Brinton, professor at the USC School of Pharmacy, the USC Viterbi School of Engineering and the Keck School of Medicine of USC, and an executive committee member of USC Stem Cell. Victoria Fox, director of the EiHS program, extended her thanks to everyone who contributed to the experience. This year’s participants were selected from Harvard-Westlake School, Lifeline Education Charter School, Chadwick School and Bravo Medical Magnet High School, and many received scholarships. On graduation day, the students shared their transformative summer experiences with their mentors, friends, parents and teachers by presenting scientific posters and by contributing articles to the program’s new EiHS Journal, which will publish its first issue in October.